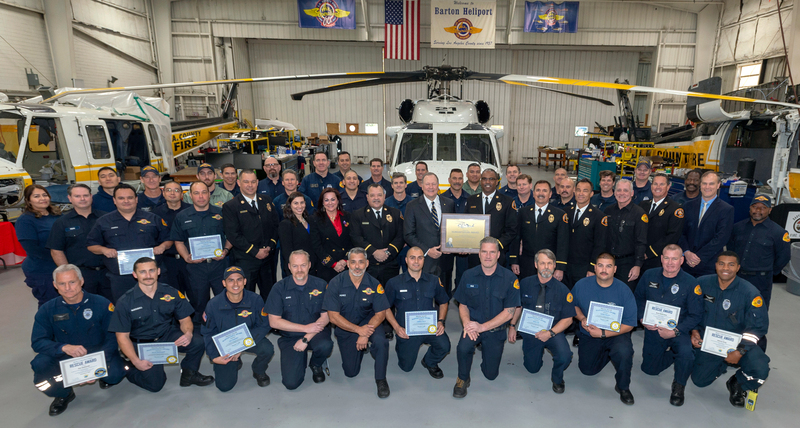 Stratford, Conn, March 20, 2019 – Sikorsky, a Lockheed Martin company (NYSE: LMT) has recognized the County of Los Angeles Fire Department’s Air Operations Section for its efforts in combating last November’s devastating Woolsey Fire with firefighting helicopters. The Fire Department operates eight multi-mission helicopters, including three S-70A Sikorsky Firehawk aircraft. During a March 12 ceremony at the Los Angeles Board of Supervisors, Sikorsky North America Regional Executive Jeanette Eaton presented Fire Chief Darryl Osby with the Sikorsky Humanitarian Award. The most destructive wildfire in Los Angeles County history started Nov. 8, 2018. Pushed by 50-mile-an-hour Santa Ana winds, the fire quickly grew to a 14-mile fire line that burned 97,000 acres and destroyed over 1,600 structures in the communities of Agoura Hills, Calabasas, Bell Canyon, Malibu, Malibu Lake, and Oak Park. More than 250,000 people were evacuated during the 13-day ordeal. Los Angeles County’s three Sikorsky Firehawk helicopters aggressively attacked the fire, dropping water from each aircraft’s 1,000-gallon external water tank for 40 of the first 48 hours of the fight, when high winds prevented other helicopters from flying. The three Firehawk aircraft accumulated a total of 120 flight hours and 350 water drops during the first seven days. The first Firehawk called into service flew for 22 hours straight with multiple crews, the aircraft only taking a break for refueling and limited inspections to ensure continuous operational readiness. Aircraft maintainers worked around the clock, ensuring maximum flight availability. The Firehawk aircrews hovered 10 feet over lakes, ponds, water tanks and residential swimming pools to refill their water tanks in less than 60 seconds. The Humanitarian Award is the Los Angeles County Fire Department’s second recognition by Sikorsky this year for the Woolsey operation. 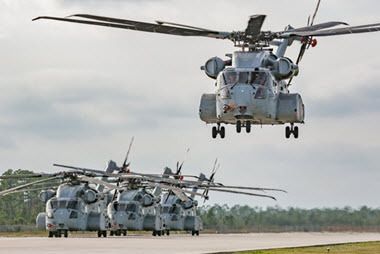 On Feb. 11, Sikorsky’s President Dan Schultz presented the Sikorsky Rescue Award to 35 pilots and crewmembers, and the Sikorsky Superior Maintenance Award to 21 members of the Maintenance Unit of the Air Operations Section.